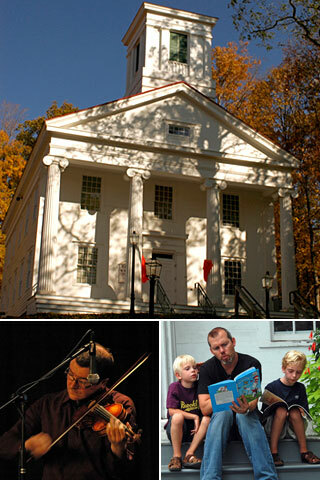 The Spencertown Academy Arts Center, entrusted with a unique historic landmark, is dedicated to preserving and maintaining the Academy building, providing a welcoming community space and to presenting programs in the arts and humanities for Columbia County and its neighbors. Join Us. Become a Member & Volunteer. For nearly 170 years our stately Greek Revival building has been serving the community in different ways. Since 1972 we’ve been a cultural center and community resource, offering a variety of free and affordable arts programs and events – concerts, readings, lectures, gallery exhibits and arts workshops and classes. As an all-volunteer non-profit arts organization, your participation enables us to continue producing these programs, as well as our annual events: Festival of Books, Revels, Hidden Gardens and to pursue ongoing building preservation initiatives. Discounted tickets to Academy produced* programs. The opportunity to participate in an annual members-only art exhibit. Special members’ promos at annual events. * The Academy facilities are occasionally used for events produced by other organizations that are not subject to member discounts.